What About Craftsman Cordless Power Tools? 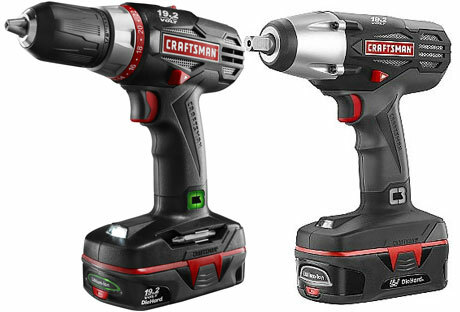 ToolGuyd > Power Tools > Cordless > What About Craftsman Cordless Power Tools? Earlier today, I posted about the best cordless power tool brands, discussing my quick thoughts about the most popular and available cordless power tool brands. I left a few homeowner-specific brands out, such as Black & Decker and Skil, and focused on the brands I felt to be of most interest to ToolGuyd readers. I also left out some of the higher brands I don’t have much experience with, such as Panasonic. I could have perhaps mentioned Ingersoll Rand in there, which makes some fantastic drills and impact tools, but they’re automotive-focused. My focus in the post was towards more construction or general purpose brands. The question first came up on Facebook responses – what about Craftsman? Not to mince words, what about Craftsman? Their 12V Nextec lineup was good, but has been all but abandoned. Their C3 19.2V tools are decent, but many if not all of the better ones are also available by Ryobi. Their 20V Max Bolt-On line? Made by Black & Decker and also available under the B&D Matrix line. More than 5 years ago, someone asked about whether it was still worth investing in the Craftsman C3 19.2V lineup. I responded in a post: Craftsman C3 19.2V Power Tools, to Buy or Not to Buy? At the time, I was optimistic. Now, not so much. Craftsman Black & Decker bought the Craftsman brand. Sears can still develop and market their own Craftsman tools. But how long until Stanley Black & Decker Craftsman vs. Sears Craftsman competition takes a toll on sales? How long until Sears declares bankruptcy? Many analysts have described Sears as spiraling towards that inevitability. How long until another contract or supply dispute results in a bigger disruption? More importantly, when is the last time Sears Craftsman came out with new cordless power tools? A quick search of ToolGuyd posts suggests that my last new Craftsman cordless power tool post was back in 2014. I can’t think of any reason for someone to buy Sears Craftsman’s cordless power tools, unless perhaps they were already invested in the lineup or have Sears gift cards to burn. It’s like the brand completely gave up. If so, and they’ve given up on their customers, does it really come as a surprise that I’ve given up on them? Or that in writing up a Best Cordless Power Tool Brands analysis I hadn’t even considered adding a Craftsman entry? I’m sorry, I just see no real incentive to buy Craftsman cordless power tools these days. Some of their tools are appealing, but you can get nearly the same thing from Ryobi. The difference is that Ryobi will support their 18V lineup for a long time. Even if Sears Craftsman has not seemingly given up on the C3 19.2V lineup, their support is tied to Sears, and Sears’ longevity is not guaranteed. It is with sadness that I consider Sears Craftsman to be a vestige of a tool brand that used to care, and of a retailer that used to try to sell tools to users like me. « Which is the Best Cordless Power Tool Brand? same for anything else branded with the craftsman logo. I’ll put it another way, golly I sure miss my mercury sable. oh no wait I don’t I have a ford taurus sho now. Yes it used to stand for something – yes they used to make good tools – my dad still has a few. However today and some 20 year ago they do not. When SBD start’s putting Porter Cable or Dewalt style ability and design onto something that sells with the craftsman name – for cheaper I might look that way and see if the batteries will fit. Otherwise – complete and total pass. I have all but the jigsaw (either version) [and I never seen the yard tools anywhere], through various deals and sales. I use the hell out of them still. I like their compact smaller form factor. Again the driving force was price. I recently got an Milwaukee M12 Hammer drill and inspection camera, so I may move my way into that since the nextec is dead. I prefer corded to cordless, but I have 4-5 different C3 tools. Their line hit my personal cost/performance sweet spot. But they’ve seemingly abandoned it, so I’m looking elsewhere. The Ryobi stuff LOOKS awful. They look like toys. But they seem to perform pretty well and the selection of tools is very large for a DIY line. The air nailers are especially attractive. I’m having trouble getting over my embarrassment at the thought of owning / being seen using those things, though…. I invested in the C3 line in 2005, and was fine for me at the time. I finally switched over to M12/M18 and couldn’t be happier. All of the Fuel tools that Milwaukee makes just are no comparison to C3. Sorry to see it go, and it will soon…. That drives me crazy. I loved the C3 version and don’t understand why Ryobi hasn’t started selling one again. There is definitely a demand for that item. They regularly go on eBay for 200 or more. It is nice for a quick car vacuuming. Wow, that’s insane how much they go for on Ebay!! I get it though it wasn’t popular back in the Nicad era it had crappy battery life, but now with lions its usable now. It is a gap in the Ryobi lineup for sure. I’d been eyeing the Nextec multitool and drill-driver for a while, and finally picked them up when a couple of good SYW deals came through. I like both of them quite a bit; the drill is smaller and lighter than my DeWalt 18v, and the multitool is lighter and more capable than my Toolshop (Menards’ low-end house brand) corded model-and it came with accessories and a decent bag. Their battery life isn’t stupendous, but the quick boost feature has come in handy, and a half-hour to a full charge isn’t that long of a wait. I’ve had no problems with either of them in the couple of months I’ve been using them. I’ll probably pick up another battery or two, and they should (hopefully) stay useful for the forseeable future, even if/when Sears goes under. I’d definitely get more batteries while you can… quick-charging is awesome for convenience, but is harder on the batteries, so they’ll probably need replacing sooner than the batteries for a system that takes hours for a full charge. At this point in time I wouldn’t buy anything Sears that I didn’t expect to toss within the next 6 months. I’ll be surprised if they make it through Christmas 2017. And I don’t feel good about writing that. I own a few Craftsman cordless and corded power tools. These were acquired over the years when a Sears was a block away from my apartment. Convenient and the price was right. The Craftsman tools got the job done and have held up well for me. Now that the Sears a block away from me has closed I don’t see myself buying much of anything from Craftsman. Not true. SBD wouldn’t have paid almost a billion $ to let it fade. They will at some point re-invent the brand. Perhaps they will wait for Sears to go belly up. Not sure why SBD would buy Craftsman and allow Sears to continue developing it. I was actually just in a Sears today looking around and overheard one of the clerks telling a customer that they had received notice that the C3 line was being discontinued. I have no way to independently confirm this but that is what I overheard. My opinion: it would make sense given the mess with the TTI lawsuits, and Craftsman switching all their other battery tools over to SBD. My guess would be a 24V lineup compatible with the lawn and garden tools to replace the C3 line and then compete against only Kobalt in the 24v space. That is if Sears can actually afford to invest in the brand, but at least with SBD’s backing it could happen, combined with retail space at Ace Hardware stores could make this a reality. I just bought the last shelf display C3 led folding light on clearance at the Sacramento Sears. All of what little remains is on clearance and none to be reshelved, I’d say it’s safe to say C3 is done! …and on a footnote, I’d say Sears is done because nothing new was there for father’s day and the place looked destitute! When I started my little “shop” about four years ago now, I went out and bought a C3 drill and impact driver, later upgrading both to a slightly better C3 model. Eventually added the mini shop vac and brad nailer, both of which got tons of use, and also relied on a Craftsman miter saw and router set. Great learning tools and probably perfect for my ability, even now, but the absurd price markup on a brand that’s lost the quality and integrity its charging for combined with the atrocious experience of shopping at Sears (or online) was enough for me. I moved onto Milwaukee’s M12 line which despite being marketed toward professional tradesmen (and women), I find to be priced right in the wheelhouse for homeowners and serious DIYers that want great quality at a fair price. Nextec definitely seems to be dead now. My local Sears even removed the display. Now there doesen’t seem to be any rhyme order reason to how the tool department is laid out. We do homes from foundation to finish carpentry and it’s hard to stick with just one brand since no one offers every tool. 90% of what we have is Makita and Milwaukee 18v, as they both offer more specialty tools tailored for the contractor than any other brands. We invested in Dewalt maybe 10 years ago and they were garbage. Their new stuff looks great, but we are too invested in other platforms to bother at this point. We have some Bosch 12v stuff, and it’s great stuff, but their 18v lineup is too limited. The guys tend to prefer the Makita stuff when given the option, but that also depends on the specific tool, and a lot of that has to do with the faster charge times too. Very convenient on any job. They have also held up a bit better, and while the Milwaukee’s rarely outright fail most of them have developed minor though obnoxious issues. Batteries that stick, the overmolds almost always come off after a year or so, the gearboxes on the drills need to be cycled a few times to shift correctly etc. If I was a homeowner I’d get some Ridgid tools, 90% as good as the big boys, lower cost and a great warranty. I’m at the point where I won’t buy anything Craftsman that is new. Outside of the COO issue, chances are the warranty on anything they sell under one of their brands will soon become worthless. I’ve had Milwaukee cordless tools for about 3-4 years now and am happy with them. I have almost all the nextec 12 volt tools and a buch of batteries. I don’t think I paid over $50 for any one of them but most were less than that. Honestly I love them. Use them all the time. I even modified a broken drill and turned it into a mini cordless hot glue gun. If they go on clearance I’ll pick up as many as I can. To be clear. I’m not necessarily recommending the nextec tools. I wouldn’t rely on them for professional work. I have real tools for that. I have a small workshop/studio in my house. My wife is involved in community theater and I end up making all sorts of costumes and props for them. For that kind of thing the nextec are awesome and because They were so cheep I have pretty much any tool I need right there when I need it. I have some Nextec I got cheap also. The drill was nice for little things but it burned up. My favorite tool though is the Hammerhead. It has limited uses but works great when u need it. I wish they still made them. Well, corded, but a couple of years ago I went back and forth on getting a Craftsman or a Ridgid shop vac. Decided on the Ridgid, though I’m sure the Craftsman would have been decent. It was just so unpleasant shopping at Sears and could never get the information I needed on the internet. If it helps at all… The only Craftsman stuff we get up here in Canada are hand tools at Sears… and it is closing stores so fast you can’t GET Craftsman much anymore up North here. So… it’s hard to justify Craftsman as anything right now. Unless they change names to something else, they will cease to exist all together when Sears goes under. Not If, WHEN. Sears still owns the Craftsman NAME… so they can either sell it off, or change it. Otherwise… It’s a moot point wondering if Craftsman makes good tools at all. Pretty soon, it’s going to be like asking whether a Dodo Bird makes a good pet for a modern family. How do you debate a thing whose future is already set for extinction in our lifetimes? Good or Bad, Great, Epic, Greatest… None of that is going to matter very much longer. Craftsman will be a FORMER brand relatively soon. Unless Stanley Black and Decker changes its name to something else, and releases former Craftsman tools under the new name, none of what Craftsman did will survive the death of Sears. I had a moment about 4 years ago where I realized that, by default, I thought that hand tools came from Home Depot and not from Sears. It was a sad realization, but an inevitable one. Sure, the HD ones are still junk, but at least I’m relatively confident that HD as an entity will continue to exist. When I read your post yesterday, I was sad to see Craftsman not mentioned. But I understood why. I am fully invested in the Nextec line, which I still think are an incredible value. The impact drivers are amazing and have always done what I have asked of them. But I couldn’t advise people to buy into the system at this point. I am basically in a holding pattern right now, often buying corded tools (circular saw, jigsaw, hammer drill most recently) because I don’t want to take the plunge into another system. I wonder when the last time a production run was done on Nextec. I’ve bought extra batteries, but I have to assume that those have been sitting on the shelf for years. With that said, I sold my C3 set a few year ago. Glad I made that decision! They were decent. I didn’t have a problem with them nor there was anything that stood out. Nice to see you are off the “Sears” band wagon. It is a dead company and there are only two ways you should get a Sears tool and that’s free and dirt cheap. That’s a little harsh. The quality has sagged and they have made a million sins. But once in awhile Craftsman comes out with something good and I am happy to pay for it. The vessel-sourced ball grip drivers and impact screwdrivers are solid tools. As are the t-handle spinners. Finally sold all of my 19.2 Craftsman tools in a bundle at a yard sale last month. Other than the lamps, never used them. Current cordless tools are Ridgid and couple Porter Cable. Wasn’t worth having a third battery platform for a couple of lamps. However, am definitely keeping my Made in USA Craftsman hand tools. Sold my C3 stuff a few months ago. Still have the wet/dry vac for the cars but that’s about it. Switched to Milwaukee M18 fuel and haven’t looked back. Sad what’s happening to Sears but it’s their own fault. I love my C3 Craftsman cordless tool set. I have 4 drills, the vacuum, reciprocating saw, circular saw, light, nail gun and on and on. I have had these for many years with no complaints and will keep them forever. Craftsman is a brand I will still stand behind and always will. I’m ready to buy all of the rest of the C3 tools that I already do not have. Wow, tough crowd. Craftsman used to have the diehards (pun) but looks like no more. Looks like most have jumped the Chinesium ship to another Chinesium ship. I still have my C3 cordless drill, impact driver, saw and sawsall. All still working perfectly fine along with batteries. They will probably out live me. I’ll keep em as long as they all still work. As the ship is sinking, I’ll just put on my mask and continue to use my tools as I’m going down. I have 9 C3 tools, some for over 10 years. They work just fine for around the house, though I wouldn’t try to make a living with them. I have a set of Makita battery tools at work so I can be objective. I’ve used DeWalt, Ridgid, and Milwaukee M28 as well, all have weak batteries. The C3 batteries so far have been reliable and hold a charge indefinitely. I just bought an XCP 4.0 batt today on a price match for $49.49. I got the 4 tool set with 2 1.5 Batts AND a 4.0 XCP for $189.00 AND a 72 dollar cashback. SEARS is circling the drain. These are fire sale prices and the only reason you do that is to achieve cash flow as you verge on being sucked down that drain. And that is why I’m buying as I am I invested in the product. Heck, I’m still milking the 20 volt professional line for heavy duty projects. These are good tools whose days are numbered. I’m 63. I’m banking they will last me but no one new. I worked for Sears all through high school and college and have an affection for the company. Time moves on… I’ll keep buying C3 as long as I can and using it. Let’s watch and comment. Still a few good ones available. I have all C3 stuff. I am sad that it appears to be obsolete. I am not a pro, so th here tools are more than what I need. At least I can buy them for even less. When its time to replace, I’ll go Milwaukee as I have their cordless blower/trimmer.